(Q) I'm going to Ireland this summer, what do you think are the special qualities of the Irish and which are yours? (A) Well my special qualities is that I was born in Ireland of Irish parents and I'm very proud of it, and I'm very proud to be Irish by birth. The special qualities of the Irish are to realize that for centuries they have lived in a very difficult situation and can still wake up every day and laugh and smile and be wonderful hard-working people. Ireland, of course, is a very very special country, full - every inch of the way - of beauties that will mesmerize you they are so beautiful to look at the mountains and the sea. God made Ireland I think that was his most beautiful job. Well naturally my favorite music is the music of the country I was born in, and some of the very ancient Irish music. I'm not talking about that modern music. I like Broadway, classical music, and opera and of course, the beautiful "ancient" Irish melodies. I love the work of Liam Neeson and Sean Connery and I would thoroughly enjoy working with either one of them. I don't know what I'd have to play - their sister, their old aunt, or their mother (laughing)but I think they are very fine performers. That's a very sad question to answer. I'm not really a part of the motion picture industry of today. They are all very young people; and when they were coming into the foreground I was living quite happily in St. Croix in the Virgin Islands with Charlie Blair. He was my everything. But you have to realize that all of my good friends starting with Tyrone Power, Cornell Wilde, Charles Laughton, Henry Fonda, Brian, Jimmy Stewart, and topping it all off with John Wayne, they've all left, and I'm still here. Oh yes - and of course Roddy McDowall, he was my dear, dear friend for many years. I miss him terribly. The fact that I got up every morning, face the day and when I went to bed at night I said "Dear God I did the best I could with today" - but maybe yesterday was better and maybe tomorrow will be better still. And I'm very proud of that accomplishment and always got up with a smile and met the day and intended to do the best I could. And many, many wonderful things have happened to me. I've been very lucky. I've had a wonderful life and a wonderful career and I just hope I have enough time left to do all of the other things I still want to do. The only thing that I didn't do that I intended to do, is the fact that I really wanted to be an opera star. But I got side-tracked and it just didn't happen. I was born a woman. I believe that women can do anything they want to do, but I don't feel that a woman should compete with a man or a man should fight a woman. Any person, male or female, can do or achieve anything they want to in this world provided they are willing to make the sacrifices necessary. (and Maureen mentioned that these sacrifices may sometimes be unpleasant). I'm not a feminist or an anti-feminist - I'm for all people getting what they want out of life in an ethnical and honest manner. (I called Maureen to finish this one later because I lost part of it). "In the old days we were under 7-year contract to the studio. We had little or no say in the publicity they put out about us. That was done by a publicity department and the job of people in the publicity department assigned to you was to write something about you that kept you name in the paper every day and in front of the public. Many times you'd hear about some of the things that were written about you and you'd go into shock...because they weren't true at all - these articles were simply the creation of somebody's mind but really had nothing to do with you - those early fan magazines. I know of one very famous actor at 20th Century Fox and they created a whole false image about him about being a bad tempered person and he was one of the sweetest, nicest young men I ever knew and that was what the studio wanted to portray to the public as his character. I remember reading things about me having a school bell (of the school I went to) sent to me, and I remember another time that I was supposedly bitten by a Trap Door spider in Australia...UTTER RUBBISH! All the imagination of the publicity department. All untrue." If it doesn't damage and harm your reputation and your family you just try to forget it because you'd need millions and millions of dollars to fight the incorrect stories in court and then the lawyer would wind up with all your money and the stories would be printed and the stories would still be believed by most of the people who read them. The wise thing to do is to ignore them and keep your money in your pocket. "Son of Pale Face" - Bob Hope wanted me to do that movie with him. I was in a terribly unhappy period of my life and I had very strict views on honor, ability and honesty and I read the script and I almost fell off the chair laughing, it was so wonderful. I thought I would be totally dishonest if I said yes because I couldn't laugh and be funny all day long; so I said 'No' -but a great friend of mine was a gentleman at MCA ( biggest talent agency in Hollywood) Levis Greene and he was Jane Russell's agent and believed in her very much and I recommended to him that he go after the part and she got it and she did a wonderful, wonderful job. Many things I would loved to have done. Naturally I would liked to have done "My Fair Lady" - you June know the story about that. Then there are books and stories I've read over the years I would have loved to have done. And of course "The King and I." She mentioned she was talking about the opera - so here is part of her statement.. I love the beauty and the grandeur of it (opera). If you were working in an opera you have to act as well as sing so you are pursuing both careers. .Maureen was delighted to talk about her dogs. I lost part of the content so I called her tonight and she reiterated her list of dogs: She said " When Charlie was a little boy, he had a dog - and Irish terrier and because he loved it so, he called it 'Charlie.' I had an Irish wire-haired terrier called Fionn (pronounced "Finn") McCool. He was called "Fionn". I had many many dogs. (she loved this question and she was laughing while she spoke of her dogs). I had one that was a rare dog, a Belgian Shepherd mix. All my dogs had Irish names except Tripoli. She was named for the Marine Corp. She was everybody's darling. She went on to name a series of dogs, "Sean - blonde German Shepherd - "Christmas" - a beige Great Dane; then there was "Easter" - Great Dane; "Summertime" - Great Dane; two other dogs in the Virgin Island "McGillacudy a Belgian Shepherd - black. She also had a black Collie. So yes, indeed, Maureen likes pets...and obviously dogs are her favorites...big dogs). I was very honored because it is a great honor. I was thrilled at all of the people - they said they never had so many people along 5th Avenue; I was very proud of that. I was very proud of myself for walking from 44th to 68th Sts. and I only rode in a little cart for 2 blocks - because they pushed me into the cart and I got out and I said, "No, I'm going to walk." And I'm very proud that at my age I walked that far; standing up straight with my head in the air. When asked if she was shy as a child, Maureen laughed and said "I was a boisterous Tom Boy" ! - meaning of course that shy she was not. since she sill owns it, that must not be a consideration at this time. I'm sorry if I forgot anyone's questions I'll try to make it up next time. Thanks again for submitting them. What was your favorite movie to make...and why? That's a difficult question. Of course "The Quiet Man," but there are many others. Making movies is a challenge. There are also many movies that I "hated" making, but there was nothing I could do about it. You were under contract, that was it! On the film that is erroneously listed as her first "Kicking the Moon Around" - Maureen stated:: "That was NOT a movie. I was NOT cast in that movie and I didn't have a part in that movie. I was a visitor on the set and they said "Oh would you stick your head around the door and say so-and-so and like a fool I did. And afterwards when I was signed by Charles Laughton and made "Jamaica Inn" they put my name in the credits as if I had a part. I DID NOT PLAY A PART, I was not cast in the film; no way was I connected with the movie other than being a visitor on the set. Most fans know you for your career in movies, but you also ran an airline in the Caribbean Islands. What was it like being the head of an airline? Do you feel you were treated differently because you were a woman? I have never been treated differently because I'm a woman. It's up to a woman to make her own life as she wants it to be. Being head of an airline I hopefully did my job properly and conscientiously. I was the Executive Director and President of the company so they paid me the respect that that position deserved whether I was a man or a woman. It was a wonderful experience and really believe I could run a big airline. The only problem with running a small scheduled airline is that you have to be on the line and you have to answer for everything because you don't have enough staff to designate duties. How will you be spending your Christmas holiday? Like most Christmases since the day I was born - with family. A new huge "Airborne Museum" (connected with nearby Ft. Bragg & Pope Air Force Base) is being built here in Fayetteville & is scheduled to have its grand opening sometime in August. Dream as I may, is there any chance could be invited here for that grand opening in light of your interest and involvement in such events through your late husband BG Blair. I actually do have "connections" with MG Dan McNeill (head of the entire 82nd Airborne Div.) and his family and bet that he would love to arrange such a visit. I even know of a precious little Southern Cottage where you could "hang your hat' for such a visit! Good Lord what a dreamer I am !!! I am always in Ireland during the month of August at the Foynes Airboat Museum celebrating their existence and the big festival that we have in the streets to help raise money for the museum and celebrate my birthday - so I'll be in Ireland and no chance that I will leave. How did your home in St. Croix fair during the most recent hurricane. Minor damages - two windows and a door were damages and all the leaves on all of the trees were blown off the trees and into the house. What movies of late have you enjoyed or found "worth" seeing? Ms. O'Hara chose not to comment on this question because she is involved in a project that would restrict her from indicating any of her "favorites" at this point in time. Good question though. Are there any projects that you're thinking about doing in the near future, if so, are you at liberty to say what they might be? The project that is in the future is "The Last Dance" to be produced by Beth Polson for CBS Television (Polson produced "The Christmas Box" and "Cab to Canada") This will be my third time with that wonderful producer. Barb: Thanks again for being so special to people such as myself!! It means so much to have someone of your caliber to look up to and admire. Two actors I have always enjoyed are Robert Young and Clifton Webb. What are your memories of working with them in "Sitting Pretty?" All good memories, but I'd have to sit down and think for a couple of hours to come up with any detailed stories. They both were wonderful people to work with; I liked them and they liked me so we got along like a house on fire. What did your brother James think of you having him over your shoulder in "Fire Over Africa?" It was in the script and we were both paid. That's the only consideration. How do you maintain such a good "STAR" (film,TV, etc) attitude without falling into the trap of becoming egocentric or "cold" towards others who admire you so much? (as we often hear happens once stardom is reached). Well, from the time I was able to breathe and think I always thought and knew that I was going to grow up and be important in the world. Therefore, the fact that it happened was great gratification and the success of a desire and wish that I worked very hard to have. My sister, Peg, achieved everything that when we were kids we used talk about that we were going to do, and all of us...all 6 of us achieved what we hoped to achieve...and what we talked about when we were little tiny tots. It's no surprise to any of us that each one of us attained an important place in life. One of my sisters; all she ever thought about was horses and she became a great horsewoman and was the first woman and the first foreigner to ever win the Emperor's cup in Japan for Dressage (riding a horse without steering gear - with arms folded). But then we had a wonderful mother and father. Did you ever meet Earl Hammer, the author of Spencer's Mountain? Yes, I did meet him. Very charming man. He wrote a wonderful book, and we made a wonderful picture. Do you drive much and have one or more cars? Yes I drive. I have a car here, in Ireland and the Virgin Islands and they are all old. I don't believe in sinking a lot of money into something you don't use that often. How did the Millennia Gala go? I think like all of the things that are organized by Irish America, they go very well. This was a very, very special occasion attended by all of the top people in the NY area and everywhere else - from Los Angeles to Washington. It was a wonderful dinner and a wonderful award presentation to the different people who were present. So many of the honorees were deceased. Gregory Peck received his award and was very eloquent and spoke very well and young Roma Downey from "Touched by an Angel" was there. I had never met her before; she's Irish, she's from Derry, and she was very charming and very sweet and I was happy to meet her. Steven McDonald, the young policeman who was badly injured and still in a wheelchair was there with his wife and I'm always happy to see him - they are wonderful. I received my presentation and there were others who received theirs and the whole affair was really a remarkably wonderful evening. We were all thrilled and I was very proud to be one of the 100 people honored. What's a "day in your life like? One when she is "on" and one when she's just herself? I attend to the duties I have to do during the day and I never cease to be anything other than myself...and that's that. What prompts her to accept offers from whomever for appearances, speeches, etc. I don't accept all of the offers because they come in dozens every day. I accept those of which I approve and my brother Charles FitzSimons approves and sometimes they come too close together; sometimes they are terribly hard work, and sometimes you are so absolutely exhausted you don't even think you are making sense; and frankly from now on I'm not going to do so many, it's just too much. Sorry. I'd be interested in comments regarding aviation. 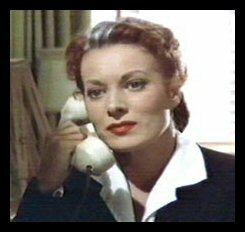 What was it like when Ms. O'Hara first started flying home to Ireland compared to "jetting" away nowadays? Aside from longer flights, did they have an airline version of the "sleeper" car? Were there tables and chairs in the mid-section? Aviation has come a long way from its infant days to now. I'd be interested in any commentary she would make. Yes, I've been involved with aviation for many years; when the immigrants in the US were given permission after the second World War to return to the country of their birth, I was on a plane as fast as I could back to Ireland and it was a very very long flight and we stopped I believed in Recovich (msp)? to gas up and to continue on to Ireland it was a long, long flight. Yes, in those days there were sleeper planes; four seats would be turned into a lower bunk and then there was an upper bunk; you first sat in your seat and you were given your breakfast, lunch, dinner, whatever it was according to the time of the day, and the stewardess came around and asked did you want you bunk made up? and you said "yes please' - she lowered the upper bunk and she dressed the lower bunk. They had large bathrooms; now it's just a small toilet on a plane, but in those days, you went into the bathroom door and there were 4 wash basins and two toilets in a small room and you undressed and put on a robe (you didn't undress entirely you just took off your suit, or whatever it was). After putting on the robe you hung your clothes up and went back to your bunk, climbed in and went to sleep and then the steward or stewardess would wake you in the morning and tell you it was so much time until you arrived at your destination. You had your breakfast and although the trips were long and very tedious, they were terribly comfortable. It was 'wonderful' to be able to climb into a bunk and go to sleep. They had a center section in the aircraft which had tables and bunk chairs around the tables and you could go there and sit during the flight and have tea or coffee or just sit and chat; read the paper or play cards; it was up to you.. Because the flights were long they had to make them more commodious and more comfortable, and quite wonderful. How's her book coming? Does she have a computer or lap-top or is she handwriting it out or using the old typewriter. Well, I'm a very good typist, but I'm doing it in longhand. I don't have a computer. I don't have a walkie-walkie phone...the cell phones. I don't have any of that modern stuff - I live in too many places and travel too much and I couldn't carry all of that equipment with me all over the world, and I certainly couldn't afford to pay for it; all installed in all sorts of places in the world. I just don't have it...and I might add... I don't miss it! No, at the moment I'm not thinking of doing any of them. I haven't heard any of them so I can't say what I think of them; I have heard any of them at all. I understand from what people say that some are very good. Since I haven't heard or seen them I have no opinion about them whatsoever. I simply travel too much, and have far too much to consider it now. I'd like to know what helpful hints Ms. O'Hara may have for a young person looking to start a career. For example, has her daughter followed in her footsteps to work in entertainment? No. - but my daughter writes beautiful music...beautiful lyrics. She did work in the early years; she did a lot of television shows for Warner Bros. and worked in some movies. She didn't continue that; I don't know why, I wish she had because she was very good. But then that was 'her' decision. As far as having a career there is one thing I have always believed.... that you can be anything you wish or desire to be in this life provided you are willing to make the sacrifices necessary and that's it as far as I'm concerned. Because if you're not willing to make sacrifices then stop crying and moaning and saying 'I want to be this... and I want to be that'...if you're not willing to make the sacrifices and hard work then you don't deserve to be this or that or the other. But if you are willing to make the sacrifices and sometimes they are pretty drastic...you can be ANYTHING YOU WANT TO BE! You published a magazine called the "Virgin Islander" - would you tell us how you got the magazine started; how often was it published, and how much of yourself went into each publication. The magazine existed before Gen. Charles Blair bought it and gave it to me to publish because he wanted me to be busy and have something to do and not be tempted to go back into the picture business. He didn't have to worry I wasn't tempted to go back anyway. But I published the magazine, I wrote an article every month for the magazine and worked quite hard; and the fact that it became a very very popular magazine in the Caribbean. From Ms. O'Hara for the record - regarding production of next movie. At this time she does not know when production will begin or where it will be filmed. Below is a statement by Maureen O'Hara taken from the on-line chat that was conducted with her on May 22, 1999. This in itself is a subject that fans need to appreciate and heed. What a privilege to hear these facts from an actress who lived it. In the future, remember to consider the old fan magazine content in the light that it was intended...for publicity...not necessarily for truthful enlightenment. I have spoken with fans and delivered information to them that was fact; questions that I posed directly to Ms. O'Hara. When I relayed the information back to the person making the query, the response was usually an alarming, "No, that's true, she must be wrong." They had "read it" somewhere and were convinced if they read it, it must be true. Even the words of the person who experienced it, couldn't convince them. Kind of scary. "In the old days we were under 7-year contract to the studio. We had little or no say in the publicity they put out about us. That was done by a publicity department and the job of people in the publicity department assigned to you was to write something about you that kept you name in the paper every day and in front of the public. Many times you'd hear about some of the things that were written about you and you'd go into shock...because they weren't true at all - these articles were simply the creation of sombody's mind but really had nothing to do with you - those early fan magazines. I know of one very famous actor at 20th Century Fox and they created a whole false image about him about being a bad tempered person and he was one of the sweetest, nicest young men I ever knew and that was what the studio wanted to portray to the public as his character. If it doesn't damage and harm your reputation and your family you just try to forget it because you'd need millions and millions of dollars to fight the incorrect stories in court and then the laywer would wind up with all your money and the stories would be printed and the stories would still be believed by most of the people who read them. The wise thing to do is to ignore them and keep your money in your pocket. Note: I have several questions that were e-mailed to me that I will ask Maureen the next time I call, and hopefully be able to fill in some more of the blank spots above - particularly the feminist question and the question about the dogs - because it was so funny. Not to worry - Maureen is a great animal lover. I have also misspelled the name of the dog. Again, sorry I don't have more detail - but I still think it was a great chat - with some great people...and a great star. First of all I want to express my deepest thanks to all of you who attended the chat. I know there were lots of "glitches" because without really sophisticated chatroom formatting and technical templates, we kind of just struggle through. Then there is me trying to type fast enough to get all of Maureen's words. This was a particularly good chat because you asked such wonderful questions and Maureen's answers were detailed and meaningful. That's the good news. The bad news is that I did not make a cache file of the chat. I was able to save a couple of sections which I had highlighted and copied, and with the help of Maureen I've reconstructed what I could. It's the old "I can't believe I did that!" thing. In the AOL chat room things are a little easier. Also, my wrist giving out on me just before show time didn't help. Oh well. I had a lot going on here and I am thusly only going to be able to present what I will call "highlights" of the wonderful meeting with Maureen. Again, I am so proud of the representation in the chat room. Your questions were insightful and interesting. Maureen agreed with that statement. I was so impressed with the wisdom and sensitivity in Maureen's responses and really almost stunned at the realization of what had taken place. A screen legend by the name of Maureen FitzSimons O'Hara Blair, took the time to talk to a handful of grateful fans and we got to be a part of that. I was very moved. My sincere apologies for any ineptness on my part. I was so busy typing I didn't field your questions very well. If I overlooked anyone, it wasn't intentional. You were just so super - all of you. God Bless...and read on.. the words below were the best I could do: (I'm not sure who asked the questions I have - but the answers are the most important anyway). Note: I did a follow-up call to Maureen tonight to fill in some of the gaps.